If Toronto wants to read the future of cars and bicycles in cities, it should look south of the border to Detroit. It’s common knowledge that Detroit saw the birth of the mass-produced automobile, boomed with the domestic production of cars for everyone, then collapsed and went bankrupt as production became unsustainable. There are a few twists to this story that are not so well known. 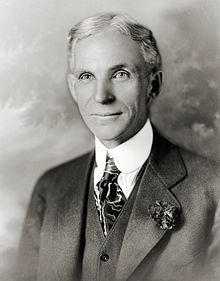 First, Henry Ford didn’t give us the 40-hour working week, a living wage, pensions and vacation pay. The unions representing automobile workers fought tooth-and-claw for these, and they won. If you like these benefits, don’t thank your bosses, thank the unions. Second, Ford hated the world he created. In the end he couldn’t stand the cities that he helped to ruin. Desparate for the world into which he had been born, he spent his final years trying to create a utopian community without cars. And finally, manufacturing is not dead in Detroit. What’s bringing it back is not cars, but – among other things – bicycles. Earlier this year Shinola commenced production in Detroit, manufacturing watches and leather goods, and assembling the bicycles they manufacture in their Wisconsin factory. If old Henry were alive today and blessed with the wisdom of his later years, perhaps he’d be busy in the Shinola factory making bicycles.